When I contacted Anwar on Sunday about going to games this week, he was well up for Thursday's game between Holmer Green and Cockfosters, but so sure on Tuesday. So I planned to do one on my own. Knowing that he had already done Heybridge Swifts, and that they had an attractive looking playoff semi final on Tuesday against fellow Essex side Harlow Town, I pretty quickly decided that that would be my destination. I also deduced that the M25 would be a pig during rush hour, so I looked for nearby towns with interesting (IE Cheap) looking shops, a good pub and decent food. I eventually settled on Chelmsford, and time would tell if that was a wise choice. The plan was to get there around 4.30, have a look round the shops and get a meal before going to the ground. I'd had the pleasure of watching my team all but relegated on Saturday. Wycombe now face a real struggle to survive, and only a win at Torquay and a home defeat for Bristol Rovers or Northampton (against flaky sides with nothing to play for in Mansfield and Oxford) will save us. Aside from the fact that it's unlikely that either team will do us a favour, I don;t have the greatest of confidence in us winning down in Devon. Still, I am all paid up and have bought my ticket and coach travel. I actually lost my Torquay ticket in all the kerfuffle post-match on Saturday and some kind soul handed it in, Maybe it speaks volumes that someone wouldn't even take it for free, but it does remind me of what a great club we have, and that there are some good people behind the scenes, even if the team are not up to it on the field. Too many times this season, the manager has been tactically inept, or the players have appeared not to care. It's been the worst season in my 23 years supporting the club, and angry supporters made their feelings known after staying behind after Saturday's game. Heybridge Swifts were formed in 1880 but they remained as an amateur club until 1971 when they joined the Essex Senior League. As founders of this league, they struggled at first, finishing near the bottom but soon enough they got things together and started climbing the table. They finished 2nd in 1981 and then were Champions on 3 successive occasions before being allowed to join the Isthmian League. They joined the Isthmian Division 2 North in 1984 and by the turn of the decade were Champions, which saw them admitted into Division 1. The success kept on coming and in 1996 they finished as runners up and were promoted to the Premier Division, which at the time, being pre Conference South and North days was step 2 of non league. They finished a best ever 6th place in 1998 and remained in the Isthmian Premier until 2009 when they were relegated. A series of mixed seasons came and it's only really this season where they have had a chance of getting back up. They have been to the FA Cup 1st Round on 3 occasions, drawing league opponents but have lost all 3 against Gillingham, Bristol City and AFC Bournemouth and are yet to score a goal in the FA Cup 'proper' rounds. Their best run in the FA Trophy came in 1997 when at the 7th hurdle and Quarter Final, they suffered a 1-0 defeat to Woking. Several famous players have turned out for the Swifts, including former West Ham player who got the club a mention on national TV show 'Fantasy Football League' Frank Skinner and David Baddiel mocked him a bit in that, par for the course for that show. Quite a few ex-Wycombe players have turned out for them too, including John Cheesewright, Stuart Nethercott and Hakan Hayrettin. 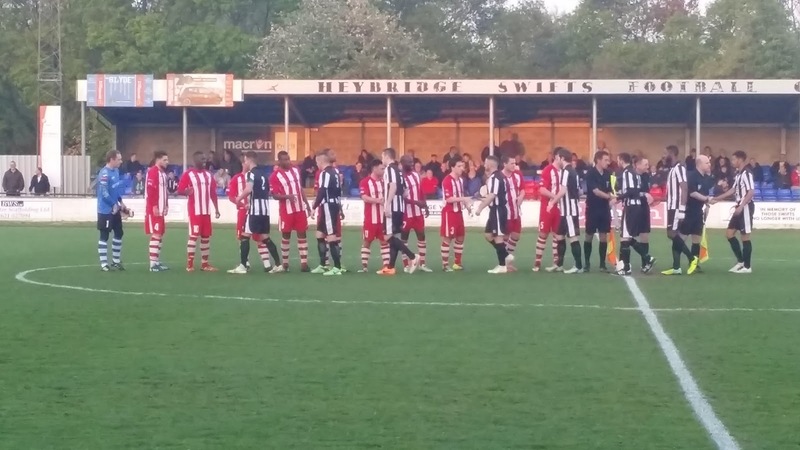 Heybridge had ended the season in 3rd place, earning them the right to play at home in the semi-final of the playoffs. Harlow were a place below in 4th, but could still have home advantage in the final if Needham Market (the best side I have seen in this league) win their game. I saw them play last season as they drew 1-1 with Waltham Forest, and they have certainly come on a bundle since then. 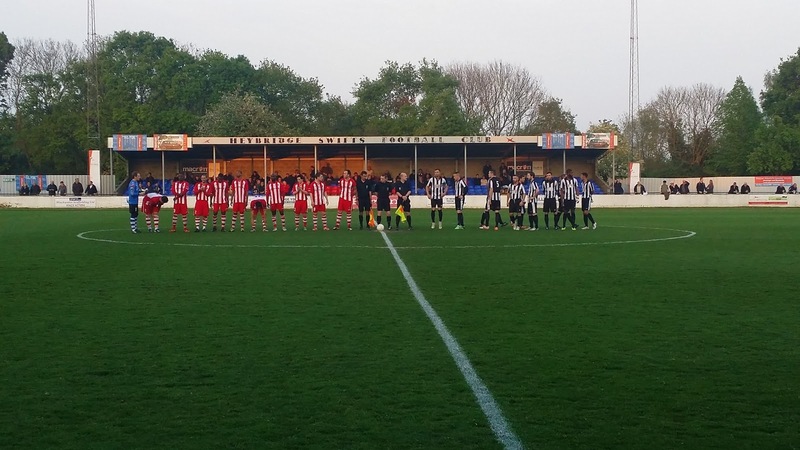 After playing in local leagues, they joined the Isthmian League in 1973-74, enjoying their best ever league finish in 1979-80 when they finished 11th in the Isthmian Premier. That was also the season they had an incredible FA Cup run to the 4th Round, beating Southend United and Leicester City in replays before narrowly losing to Watford in an epic 4-3 defeat. They have got to the second round of the FA Trophy on 2 occasions, most recently in 2002/03 where they lost to Lewes. 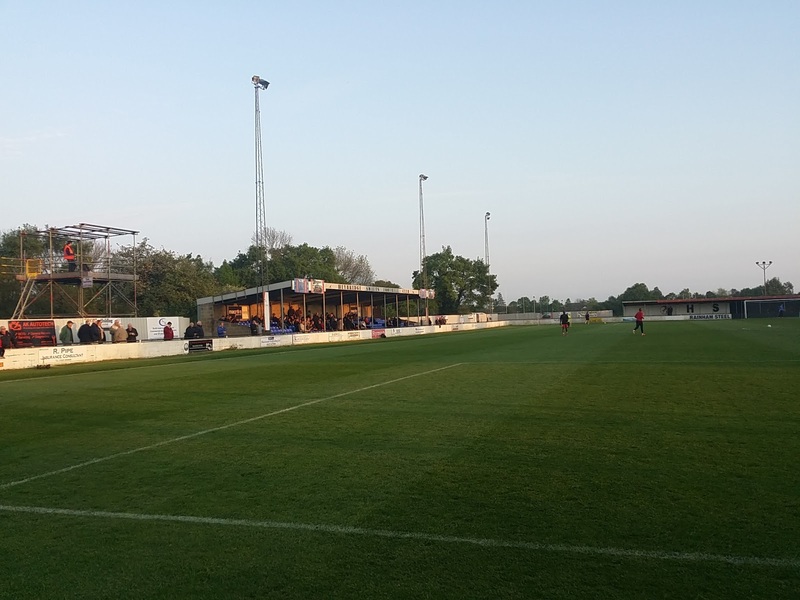 The biggest moment that they have had at their new ground is hosting Macclesfield in the FA Cup 1st Round in 2008, where they lost 2-0 in front of over 2000 fans. They moved to the Harlow Arena in 2006 and it's a very smart venue. They have even installed a 3G pitch this season to minimise postponements and maximise revenue from non matchdays. Previously they played at the Harlow Sports Centre and despite hosting over 9000 against Leicester City, they had to spend a season out of football in 1992-93 as the Isthmian League deemed it unfit for purpose - they had spent the end of the previous season sharing at various local grounds. I'd actually seen them play a few weeks ago as they beat Witham Town away from home quite impressively to seal their spot in the playoffs. On the day of the game I had my day off as usual and I wanted to get my hair cut. I also wanted to get a bit fitter and hadn't really made any effort since I went for a jog 2 weeks ago, mainly due to being busy and the weather being gloomy. So I checked the BBC weather website, there was no rain scheduled until 3PM. So I decided to jog down to the hairdressers, only finding out when I got there that it had started to close down on Tuesdays. So I had a dilemma - do I got back to Hazlemere and get it cut at a place I stopped using a few years ago as they always cut my hair too short. Or do I go down Wycombe, seen as I was over halfway there already? I chose the latter option and got it cut at a very good place called 'Chaps' who as a special bonus had a nice friendly dog there. At £8.50 it was by far the cheapest place in Town, even if it was a tiny bit more than I normally pay, but it was nice and new and well worth it. I also went to Poundland and got a few bits, including a drink as I was parched by then. Then off home I went, having jogged/walked about 9 miles. I then had my lunch and chilled for about 45 minutes before leaving at 3. The journey to Chelmsford was a decent one and I was there by 4.30. I tried to pay for 2 hours parking on my phone but they wanted £7 for some reason. So I just paid for 1 hour, and then paid another quid for evening parking a bit later. First stop in the town was cash converters where I got myself a copy of GTA: Liberty City for a quid. I was glad s it costs about £7 in CEX. I then had a look round some other shops before going to the Alehouse for a drink. I chose a pint of each of the weakest ciders that I had not had in Old Duddahs Cherry and Abrahalls Slack Alice. I then used up another hour by going to various shops, purchasing myself some Irn Bru before getting a pizza for dinner. It was only £3.99 for a 10.5" Mexicana pizza which was great value. After calling in at Home Bargains it was nearly 7 and time to drive to my game at Heybridge. I got to the ground just before 7.30 and paid to get in and picked up a programme. Annoyingly the club shop was closed so I went to the toilet and continued typing my blog while I waited for the game to start. I bumped into the Spurs fan that I had met at Witham last time I was in Essex and had a quick chat with him. The tannoy was playing all England football songs to get everyone in the mood for the game. I went round taking some pictures of the ground and checked out Facebook in the final few minutes before kick off. 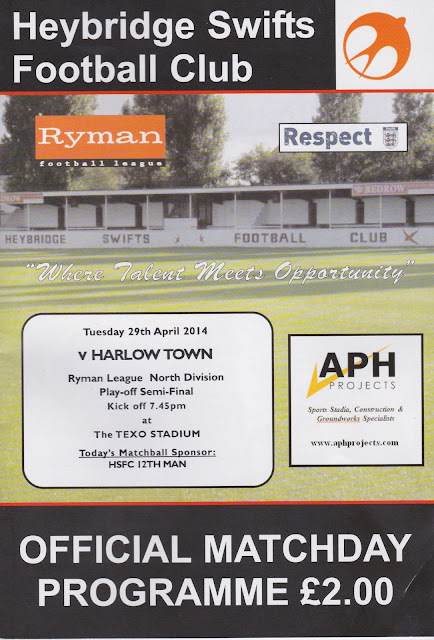 As with at Witham a few weeks ago, Harlow Town fans travelled in numbers and were in good voice. I noticed how close 3 of the teams in these playoffs were - Heybridge Swifts, Harlow Town and Witham Town all being local rivals and the 4th, Needham Market being an hour further east. The home support also made some good noise and were encouraged by a highly enthusiastic tannoy man. I got myself a decent spot for watching, on the bench in front of the press box. The opening exchanges were good and entertaining but fairly level. Chances for both sides came, but without seriously threatening either keeper. Both sets of fans continued in fantastic voice throughout the game and it made for a great atmosphere. The visitors took the lead through ace goalscorer Alex Read who is closing in on 50 goals for the season. His shot went in off the top of the right hand post after a series of sustained pressure from Harlow. The lead was doubled on 35 minutes when Leon Antoine followed up a loose ball into the box and finished with ease against home keeper Ashley Harrison. Like at Witham, they were making easy work of their fellow Essex side and looked like they could go on to score a few more. Despite some pressure by Heybridge in the closing stages, Harlow remained 2 ahead at the break. At half time i had a walk around the ground and grabbed some more photos as well as going to the toilet. I returned to pretty much the same spot for the second half and like the opening period, it was entertaining but a bit cagey in the opening exchanges. It seemed game over on 55 minutes though. A home clearance was smashed into the side of Harlow striker Leon Antoine, he bought it down and controlled it and hit it past home keeper Ashley Harrison, who if I remember correctly used to play for Maidenhead and also worked at the Wycombe Wanderers football in the community. The game continued with chances for both sides and Heybridge were unlucky not to pull one back when they hit the post. As the game wore on, the chances got few and far between. But credit to the Heybridge fans, they were absolutely fantastic and didn't stop singing all night, despite never looking like getting anything from the game. The game ran pretty late, until 9.45 but there were no further goals. It had been a good contest though and Harlow were well worth their win and I expect them to triumph in the final on Sunday. It was a pretty decent drive home, with minimal delay, just the usual 50mph through roadworks on the M25. I made good time and was back home by 11.15. I watched TV for a bit before going to bed around midnight. SCRALEY ROAD is a great ground for step 4 and is easily good enough for a couple of levels up in the Conference South. The side where you come in contains the tea bar, the clubhouse and the club shop, neither of which I used on the night. It is also an open terrace. The opposite end is a covered terrace holding around 600. To the left is a stand holding just under 400 on red and blue seats. Finally on the right is covered benches alongside the press area and tannoy box, this has a capacity of around 400. When driving to the ground I saw a chip shop nearby but didn't get much chance to explore. I'd say the ground was well worth a visit, it's one of the better ones in the league and had a great atmosphere when I went. Some of the pictures below are from 2008 when I stopped off to take pictures, as these are in a clearer light.